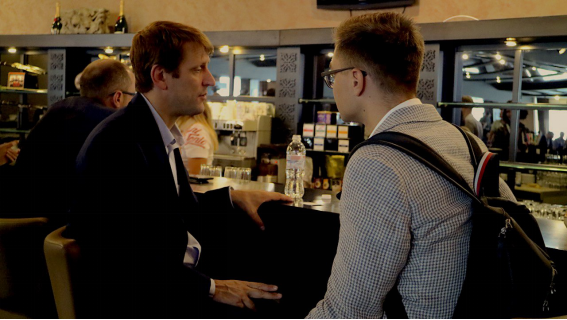 BASE.INFO chief editor, Daniel has interviewed Jeff McDonald, NEM foundation co-founder, during BlockchainUA conference in Kyiv. They have talked about the advantages of the NEM blockchain and the future of the crypto market and the blockchain technology in general. Daniel: Do you position your project as a developer-friendly platform? Jeff: Yes, it is the most developer friendly platform that I’ve seen. Daniel: A lot of ICO projects nowadays launch their ICOs on Ethereum blockchain. Jeff: Yes, Ethereum is the most popular blockchain for launching ICOs. Daniel: Some of the ICOs use EOS or Waves blockchains, but that didn’t become a new trend. What is the advantage of the NEM blockchain for the ICO projects? Jeff: Projects use NEM if they want a secure blockchain for their platform. If you want to raise a lot of money, Ethereum has built a whole ecosystem where you can make it, and become a part of the organization. Other blockchains are a bit similar in their technologies, but they give billion dollars to the project for the further development. 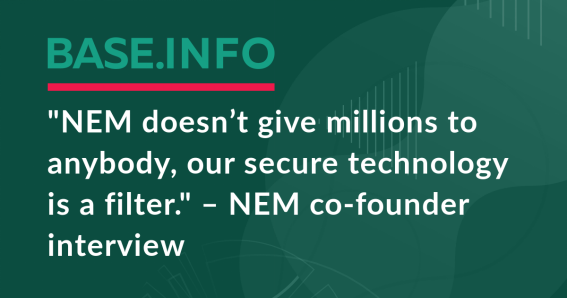 NEM doesn’t give millions of dollars to anybody, we believe that our secure technology is a filter. The projects who want safe and secure technology they choose NEM. Other blockchains have their own advantages and they do something that is better than NEM. But there is at least one project per day that chooses NEM. And they don’t get any Money, because they like our technology, they know that they can get more Money on Ethereum, but they still choose NEM. Because they want a secure platform. We have clients who have partnerships with various big companies like 7/11, and they have millions of views and a good profit. And the security was the key to that success. That’s why they choose NEM. Daniel: Is there a need for the projects to run the ICO? Because the ICO market is going down from day to day. Jeff: You know, most projects don’t need an ICO. Daniel: So why do they do it? Jeff: Because they want to make money. It is a good way to get fundraising. Daniel: But the collected funds go for their own needs, but not for the projects. Because there are a lot of examples when teams are successful in gaining money, but they are not successful in making the product. Jeff: Yes, and that’s why a lot of successful projects go to NEM because it is easier and more secure. Not everyone needs do launch an ICO, but there are some majority needs for that. In my company, we don’t need our token, but we needed a blockchain. And we use NEM, of course. Daniel: Could you imagine the world without the blockchain? Jeff: No. But some people say that blockchain will take over everything. I don’t believe that’s true. Daniel: What spheres of life and work will be overtaken by the blockchain? Jeff: Blockchain does three things well. It allows your businesses to become more trusty, to show transparency. Taking items putting them on the blockchain. Another thing that blockchain does is to create new markets or to serve existing markets. Our NEM blockchain completes half of a billion transactions per month. Just under the private database in the cloud. For example, there is a standard company existing for a long time. By adding blockchain services they are able to trade points they wouldn’t be able to trade with their partner companies before. The blockchain is famous for its security. Companies won’t be getting hacked with the data in the blockchain. But it has a big scalability problem. So blockchain is good in those three cases trust, secure and creating new markets. Daniel: There are more than three thousands cryptocurrencies now. What do you think about the cryptomarket in 2 years? Will the amount of the crypto coins be less or more than today? Jeff: More coins, more money. Crypto market now it is a half billion dollars. We know that the DotCom bubble has thrilling of dollars, but it popped. The DotCom bubble, if you look on the chart had a huge pop-up, then a big pop. But after that gradually, it became even huger than the initial bubble. The same thing will happen to the blockchain. There will be a bubble on trillions of dollars, it’s gonna pop, but than blockchain will be more trusted and valued truly for more than billion of dollars. Daniel: The NEM coin capitalization is something around $800mn. Is it important for you to reach the billion? Jeff: You know, a billion is a nice mark. But we had 10 billion before. The more money is better of course, but that’s not our main goal. We are going to launch more product building on NEM, more companies using NEM. Daniel: So you are not focused on money? Jeff: Our focus is getting adoption and real people using blockchain. And that is very dependent on the money.